To open the settings, click on the icon on the chart menu bar, which will open a panel of visual settings on the left; select the second tab (“Cluster Settings”). Font Size - it works without options Auto Size. Custom proportion histogram volume. This option allows you to put the value of the cluster, which is taken as 100 percent and will be built with respect to its proportion. Proportion by all bars - the proportion of construction with respect to the largest value among the busiest bars. Proportion Gradient Rate - the intensity of the the fill clusters relative to the largest value. 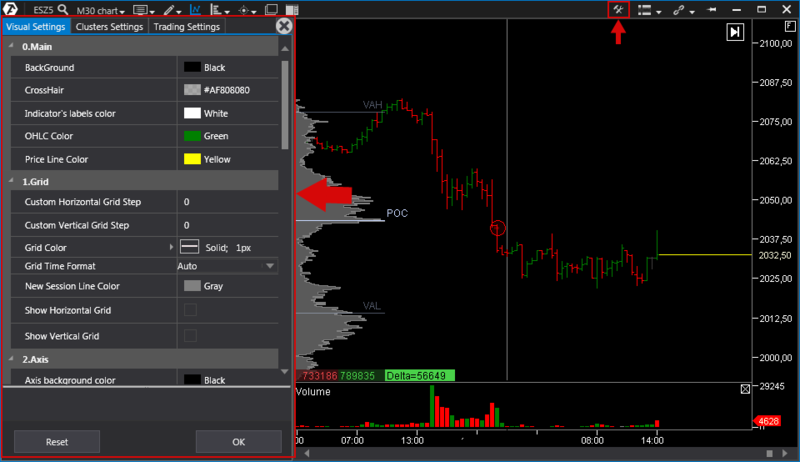 Use Proportion - if this option is enabled, the proportion is taken relative the largest value on the visible area of the chart.If it is disabled, the proportion of construction relative to the largest value in a bar. Maximum Volume Color - color setting maximum volume in a cluster. 5.Bid/Ask Imbalance - It allows you to automatically highlight the imbalance of market purchases and sales in each spread. Imbalance value is determined as a percentage of the compared volumes, more here. *To reset the settings, press Reset. To save the settings, click ОК ( at Visual settings tab).